FRANCES SLOCUM continued living near Peru, Indiana until 1847 when she died at the age of 74. 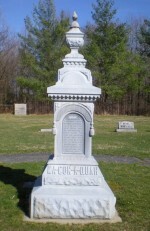 Pictured is a monument at her grave site erected in 1900. On its four sides is recounted the story of her captivity and life. In Indiana there are an elementary school, a high school, a park, and a trail named after Frances Slocum. In 1840 a treaty between the United States government required the Miami Indians to leave their home in Indiana, ceding their land to the federal government, and relocate in the Kansas Territory. Slocum’s remaining brothers, joined by others, appealed to Congress asking that an exception be granted to Slocum and her descendants allowing them to continue to live on their land. A Congressional Resolution was passed granting 620 acres to Slocum and the members of her village in Indiana. The remaining Indians were called the Eastern Miamis as opposed to those who had to move—the Western Miamis.